Just a quick note to let you all know about the National Papercrafting Month promotion from Close to My Heart called "Rock the Block"! 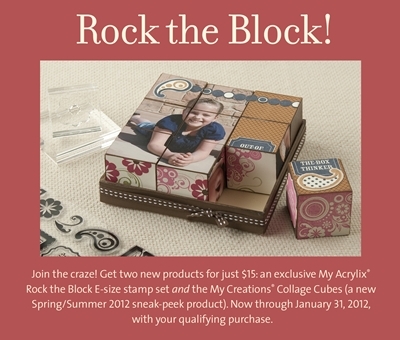 Place a minimum order of $25 between December 19th and January 31st and you can get TWO brand new products for just $15; the My Creations Collage Cubes (sneak peek of a Spring/Summer 2012 product) and the EXCLUSIVE "Rock the Block" E-sized stamp set! That is a retail savings of almost $30!! So many great ideas!! I can't wait to get into my craft room to start playing! Hope these links have inspired you too!! Contact me before January 31st to order or shop online to get yours!! Carla, how sweet of you to mention me! This is a GREAT promotion! Great post. I did a post just like yours on my blog today. There are so many crazy talented consultants out there! 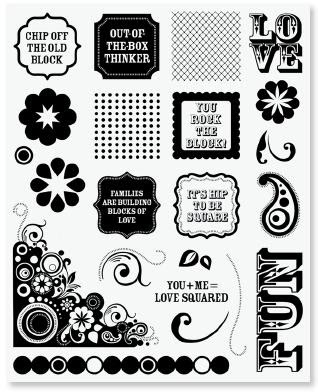 I can't wait to see what you create with your Rock the Block set.